If you remember the bathroom I posted last year, then you’ll already know how ingenious Leanne and Gareth are at revamping their once derelict house into a calm and beautiful home. Let me show you their bedrooms. All of them use salvaged, vintage items to furnish and decorate the spaces and all use colour and texture to create zones within the rooms. 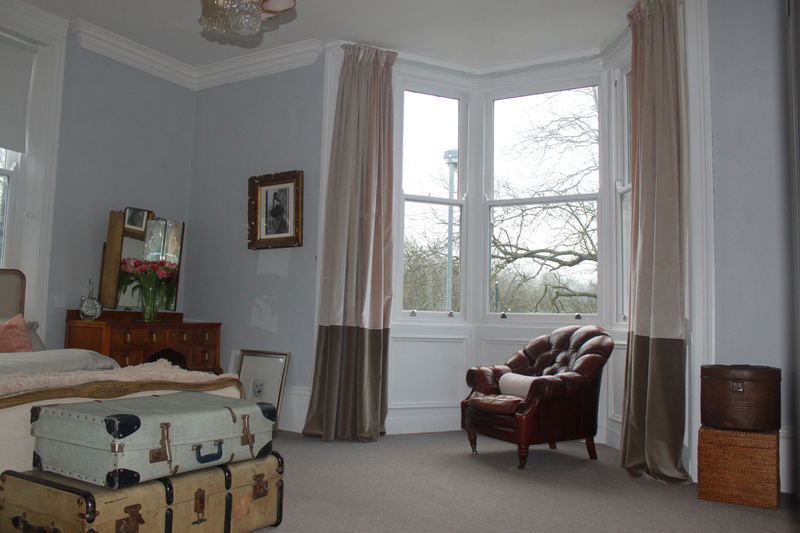 The end result for each of the rooms, however, is stunning and very different from each other. One of the main features is the alcove painted in metallic gold. It’s sumptuous, shimmery and adds a texture and drama to the room. Bringing the gold edge around the corner instead of finishing flush to the edge draws it further into the room. They stripped the existing fireplace of layers of gloss paint to find the beautiful marble surround and hearth underneath. 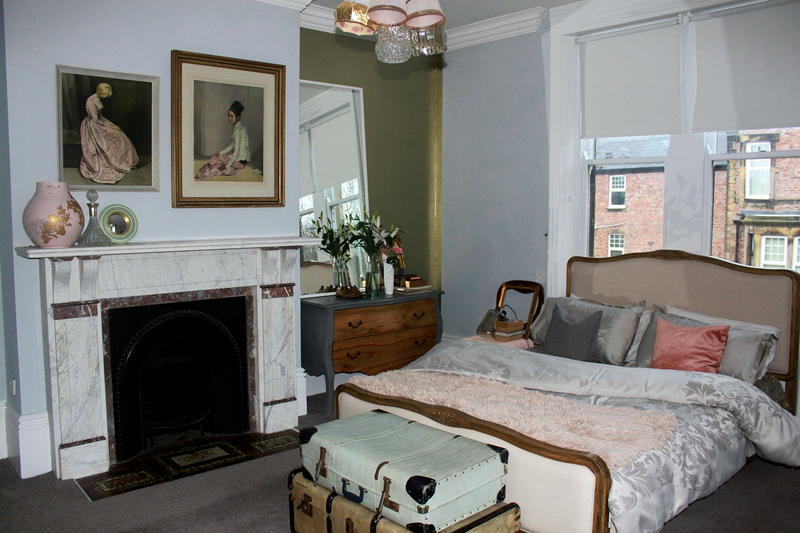 Vintage trunks create extra storage at the foot of the bed, an antique dresser sits in the corner and old lampshades are upcycled into a lovely centre piece for the room, helping to make this room a serene and calm space to sleep. 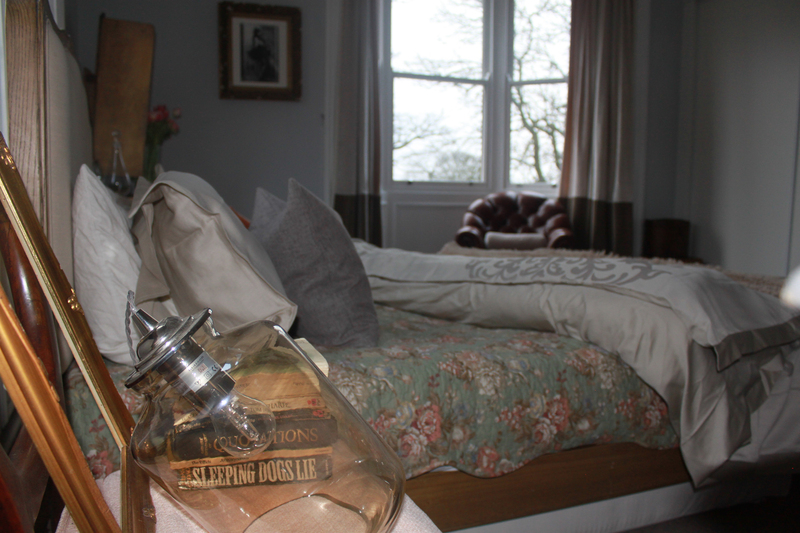 One of the attic rooms was designed for Leanne’s brother, currently lodging while he’s at university. 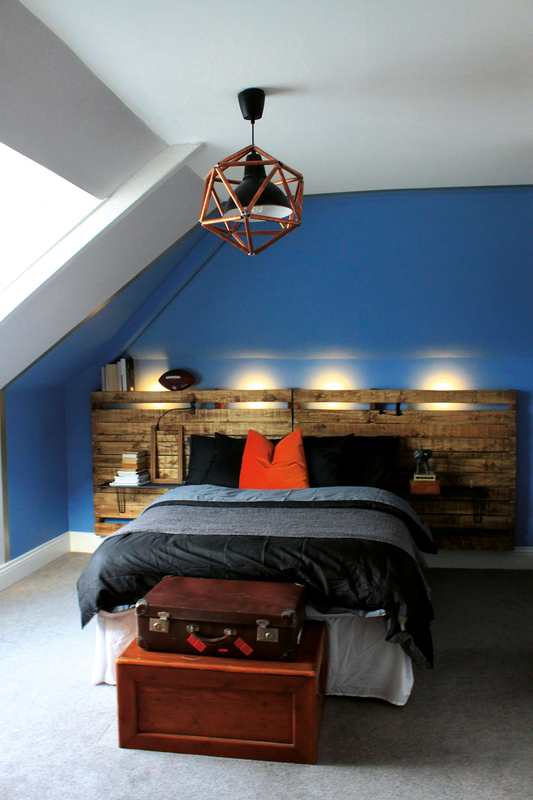 Some of the largest pallets I’ve ever seen were sourced to create this oversized, upcycled headboard. 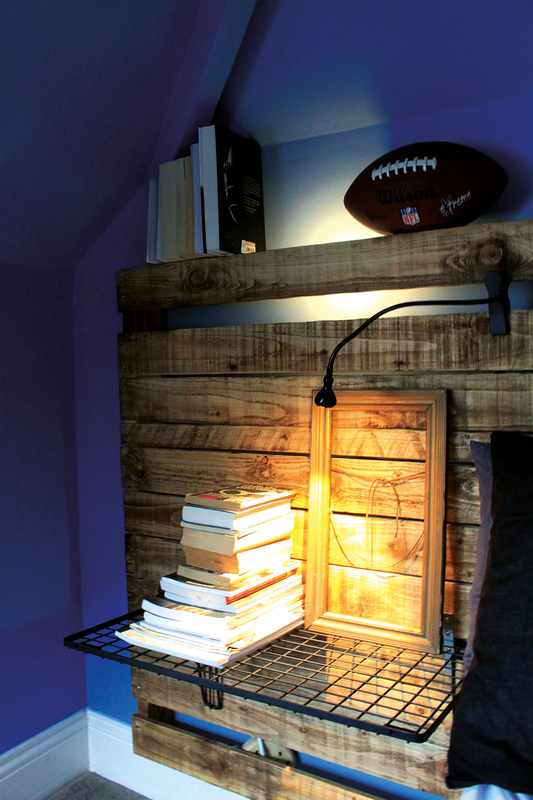 Stained to give an aged and antiqued look, there are hidden uplighters behind and it sits just the perfect amount away from the wall to double up as a book shelf. Old wire shelves were spray painted black and fixed to the pallets to become side tables. Even the light is ingenious, created from leftover copper pipes from plumbing work. Gareth designed the geometric shade to add to the industrial theme. This is definitely one of my favourite pallet projects so far. 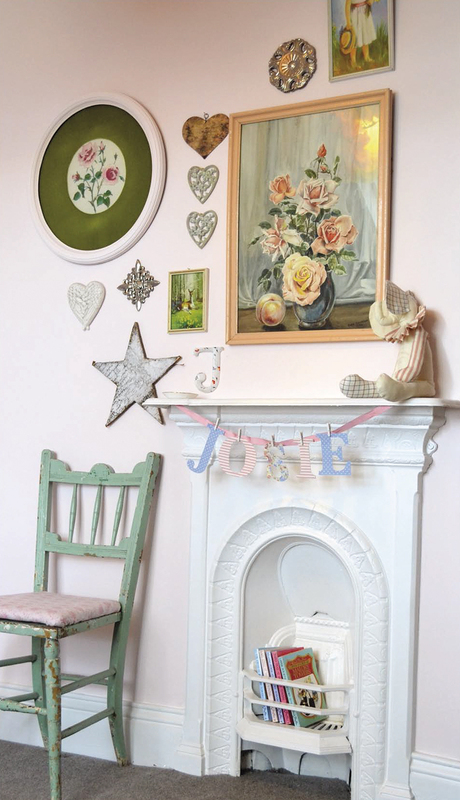 In the nursery, it’s a tale of frills, distressed furniture and a vintage doll’s pram that once belonged to Leanne when she was a child. 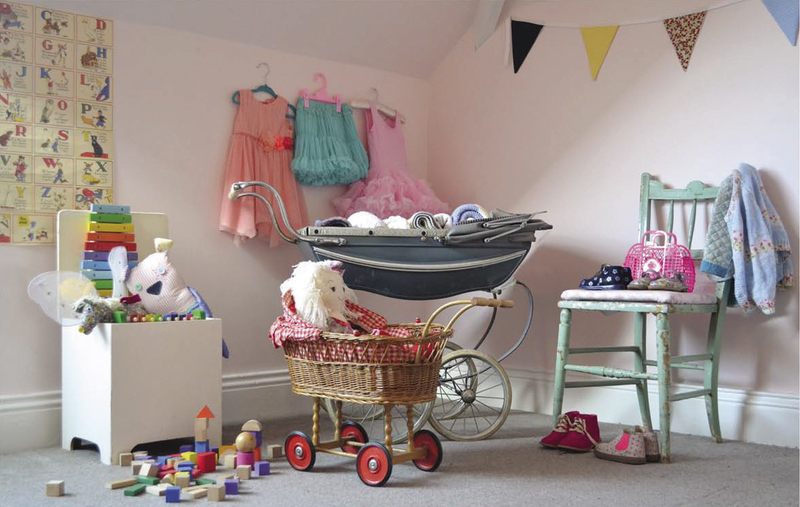 Turning what was once an attic full of junk is now a gorgeous room for the girls to play and dress up without a plastic toy in sight. You can’t miss the huge pom pom light when you walk into the room. 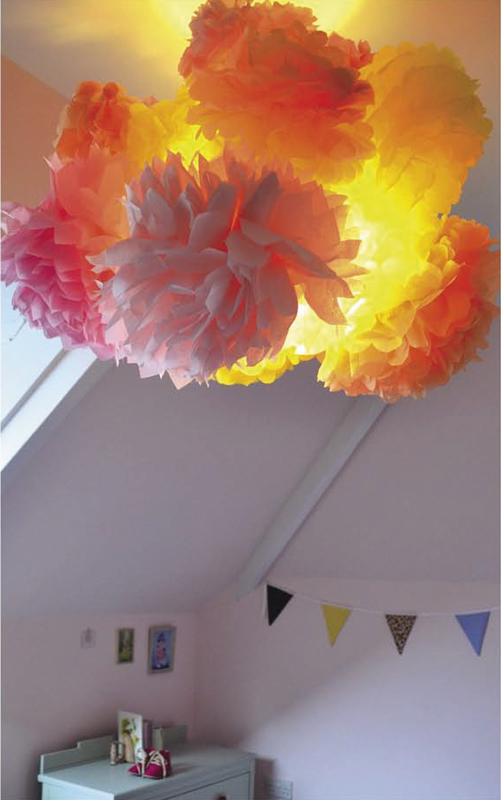 The pom poms are simply stuck to a large paper shade and give off a beautiful, warm glow. To put it simply, I love this house.